Geotomography identifies high-density mineral deposits by aiming cosmic rays, called muons. Scientists in British Columbia are researching a new mineral exploration technique that relies on three-dimensional “pictures” of ore deposits. The inventor of the technology, Dr. Doug Bryman, says his research started about five years ago, when he was approached by people in the mining industry who were looking for techniques to find high-density underground ore deposits. The technique, known as muon geotomography, operates on a similar principle to a CAT scan, which uses xrays to produce images of the human body, says Dr. Bryman, who is J.B. Warren Chair at the University of British Columbia Department of Physics and Astronomy. The research is being further developed by Advanced Applied Physics Solutions (AAPS), a Centre of Excellence for Commercialization and Research (CECR), funded under the federal Networks of Centres of Excellence program. AAPS, the commercialization partner of Vancouver's TRIUMF — Canada's national laboratory for nuclear and particle physics — brings together academics, government and industry from across Canada to bring Canadian innovation to market. “In this case we’re using cosmic ray muons, which are a different type of particle than xrays, that also get attenuated when they pass through matter, and can be used to produce an image of the earth in a similar way that CAT scans operate,” said Dr. Bryman. The technology has been noticed by the Canadian federal government, which this month gave AAPS $1.8 million in research funding through its Western Economic Diversification program. Sensors are placed underground to measure the density of the deposits above. The research is currently using existing mine shafts, while the plan is to eventually insert the instrumentation into boreholes. The technology has been tested at the Mt. 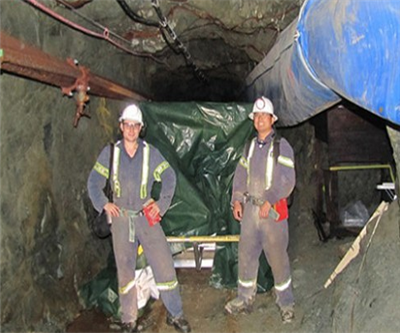 Maya Mine on Vancouver Island, British Columbia, with further testing planned for different sites and with different types of mineral deposits. Bryman said it is most effective with high-density deposits such as volcanogenic massive sulphides (VMS) or uranium. Thomas Bissig, a research associate at the Mineral Deposit Research Unit at the University of British Columbia, was cautious about commenting on the technology until he learns more about it, but said one limitation of the technology is it requires detection from underground, either by a mine shaft or borehole. However, he said it may be useful in mature mining districts where a number of drill holes and underground working already exist. Bessig said high-density deposits already have a good geophysical response with available exploration techniques, but lower grade sulphide deposits suffer limitations because the sulphides are disseminated. He said the new technique could help to identify and classify such deposits, if the test results prove successful. Bryman said he expects the technology to be commercialized in the next 18 months.